If you’re a fan of an elegant, simple and timeless bridal look, these beautiful ‘ballerina inspired’ wedding dresses from foxbride will be on your major want list! The new collection brings movement and flow to designer bridalwear, showcasing must-have pieces for any bride looking for luxurious understated elegance. 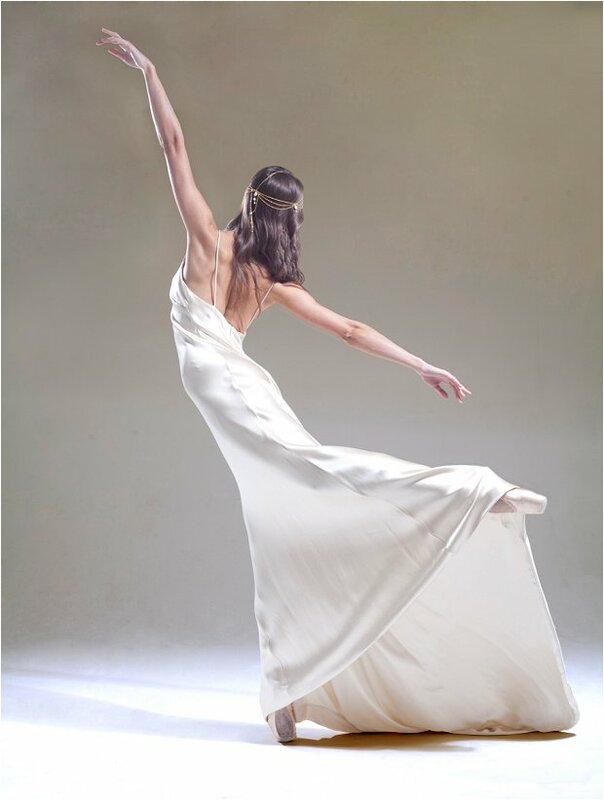 July 2015, London: Bridalwear label, Sabina Motasem, launches the new ‘En Pointe’ collection with styling and design inspiration taken from the world of ballet. The collection is available to view at the Islington-based studio with stunning ballerina imagery starring a real ballerina, Kate Byrne who dances with the Royal Opera House and the National Ballet all around the world. Sabina Ali, the founder of Sabina Motasem, says, “I have taken inspiration from ballet for my latest collection of dresses. A ballerina, just like a bride, encapsulates elegance, grace and beauty through refined movement and flow. Each dress is handcrafted in London and made from the finest Italian silk crepes, chiffons and satins and French lace to achieve the highest quality finish. The dresses are timeless, flattering and wearable. The collection combines glamour and sophistication with elegantly modern lines to create a luxuriously understated look. Lily Raindrop – another over-dress in sheer georgette with a choice of raindrop-patterns in either crystals or pearls trickling down the dress. Evelyn Chiffon – a sheer version in a super sheer delicate chiffon. Prices start from £1400 for the ‘En Pointe’ Collection and are available throughout the UK and internationally. Shorter timescales are possible too. Exciting news of things to come, is a ‘Luxe’ collection being launched in Autumn, just before the Christmas festivities. This will be a collection of highly covetable gowns adorned with intricate embellishments, made from the same signature silks, in simple shapes and innovative cut the dresses are famed for. Prices will start from £2500. Sabina Ali says “I love the romance that comes from vintage Hollywood and the passion that comes from ballet. I love to sprinkle a bit of that magic glamour and sophistication into everything I do,”. How gorgeous – I absolutely cannot wait to see the new luxe collection. To browse this delightful ensemble pop on over to Sabina Motasem. And if you’re looking for a UK stockist head on over to Rock The Frock. Love ballerina inspired wedding inspiration? Check out this elegant ballerina inspired mood board. Stockists include: Bridal Path (Hertfordshire), Agape Bridal (Cheshire), Rock the Frock (Essex),The Wedding Club (Birmingham & London), White House (Hampshire) and internationally atThrough The White Door (Perth, Australia), Something Old (Madrid, Spain) and Frilly Frocks(Drogheda, Ireland). Photography by Oliver Prout.